Browse > Home / Headlines, Life, Science, weather / WEATHER GEEK: The big windstorm has arrived; watch & hear about it here! UPDATED 7:00 PM: Hi everyone! This will be brief, I just got home and the winds are already starting to howl to over 50mph! A strong cyclone will generate high winds through midnight tonight. Gusts over 55 mph are likely, especially in exposed places along Puget Sound like Three Tree and Alki Point. The recent heavy rainfall during the last few days has saturated the soil, allowing for easier toppling of trees. 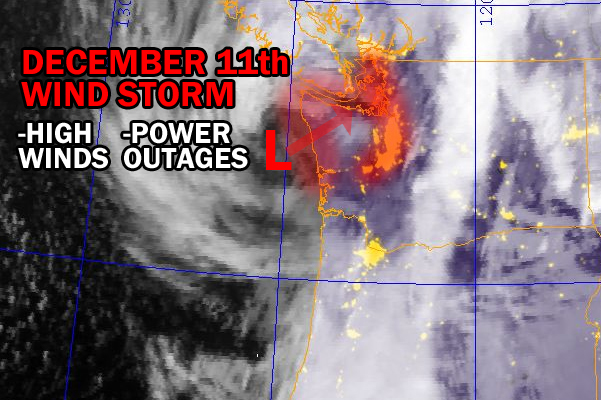 Tonight’s storm could bring widespread power outages throughout the region (especially in Burien/South Puget Sound). Below is a live chat room if you want to chat or report conditions where you are! Enjoy the storm and stay safe! !